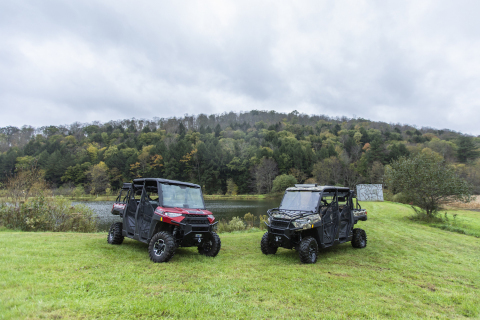 MINNEAPOLIS--(BUSINESS WIRE)-- Polaris RANGER®, football great and avid hunter Joe Thomas, and a group of wounded and disabled veterans participated in a hunt to raise awareness and funding for LEEK Hunting & Mountain Preserve. Committed to the recovery of our nation’s veterans, LEEK provides an outdoor retreat for wounded warriors and their families by using hunting, fishing and outdoor recreation as a means of rehabilitation. With the help of the RANGER Country™ Heroes Hunt campaign, LEEK aims to raise $100,000 to support the expansion of Dunham Hall, which provides lodging and meeting rooms for veterans and their families. In support of the fundraiser, LEEK will also be giving away a 2019 RANGER XP® 1000 to help drive awareness and excitement. To jump start the campaign, Polaris donated the first $25,000 along with three new 2019 RANGER CREW® XP 1000s. One of the vehicles was retrofitted with hand paddles to assist disabled veterans and allow them to participate in hunts on the property regardless of their current physical status. Joe Thomas, record-holding offensive tackle with 10,363 consecutive snaps, participated in the RANGER Country Heroes Hunt because it combined two of his passions: hunting and supporting our nation’s veterans. Throughout his 11-season football career, Thomas would often travel overseas to support our nation’s troops. Utilizing RANGER vehicles to get around the 400 acres of property, the Heroes Hunt included nine wounded veterans, representing the U.S. Army and Marine Corps branches, who participated in six hunts over three days. LEEK received tremendous support from the surrounding community, some of which attended a celebratory welcome event with Polaris where the three RANGER vehicles were donated to kick off the hunt. Browning Arms Company, a maker of firearms and outdoor gear, also supported the hunt by providing gear and shotguns for the warriors to use during their three-day hunt. For more information about LEEK Hunting & Mountain Preserve, to donate and to enter to win a 2019 RANGER XP 1000, visit donate.onecause.com/heroeshunt or text 512-920-5521, and follow on Facebook and Instagram. LEEK uses hunting, fishing, and outdoor recreation as a means of recovery for veterans and their families regardless of their current physical limitations. The award-winning, 501(c)(3) facility has been decorated by the Department of Defense as the winner of the Prestigious Zachary and Elizabeth Fisher Distinguished Civilian Humanitarian Award and will use 100-percent of the profits raised to expand its Dunham Hall facility. In 2017, RANGER kicked off its RANGER Country initiative by honoring five towns that embodied the RANGER Country lifestyle, with Pinedale, Wyoming, earning the moniker of RANGER Country USA. In 2018, RANGER evolved the campaign to show its support for the men and women who serve and protect the RANGER Country way of life. RANGER is recognizing the LEEK program for representing the values of RANGER Country, while providing the RANGER community an opportunity to support our nation’s veterans by donating to LEEK. For more information about Polaris and RANGER Country Heroes Hunt, visit polaris.com/rangercountryheroes, and follow on Facebook, Instagram and Twitter.